Carthusia is an Italian niche fragrance line; their Mediterraneo is one of my favorite summer citrus scents. I first tried Uomo last year on a test strip in Bergdorf Goodman, and later managed to score a sample. It has been languishing in my didn't-love-it-didn't-hate-it drawer for some time now, and I decided yesterday to finally give it a second try. The notes are raspberry, kelp, and rosewood. Uomo is, first of all, nothing like what I expected from the notes. It is a sheer, almost transparent fragrance. The raspberry is there, but the overall feeling of this scent is not in the least fruity or sweet. Likewise, I can just make out the kelp, and perhaps a touch of saltiness that suggests seawater, but I would not classify this as a marine scent. The rosewood is the real star here, and the dry down is mostly a very soft, subdued woody scent. It is a perfectly nice scent, and if you adore rosewood it might be perfect. It just completely fails to move me. I would not classify Uomo as overtly masculine, but given that about half of the scents I own are either men's or unisex, my bar is perhaps set higher than most. It certainly isn't girly. 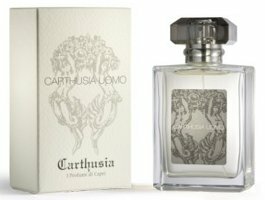 For buying information, see the listing for Carthusia under Perfume Houses.